Who is thinking about flip flops on a day like today with snow on the ground??? I can't wait until Flip Flop weather, and am LOVING feeling refreshed with this SALE today! 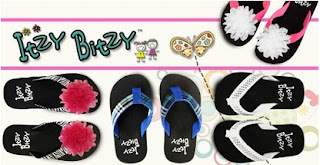 Itzy Bitzy Flip flops are quite the hit with our girls. This SALE is awesome as you'll find flip flops for both boys and girls for ONLY $6.99. There are several different styles and sizes to pick from! Zulily is one of my FAVORITE places to find GREAT DEALS online. Check it out and let us know what you find.